Technology and our online social culture has drastically changed how we do business, and as we embark upon new goals in 2017, we need to consider how quickly our HR industry is changing to keep pace. We need to examine how our own processes must adapt in order to maximize business success. In this spirit of adaptation and change, our recruitment experts at BlueSky Personnel Solutions have identified the following key trends that we believe will have a significant impact on HR and hiring managers this year. Hiring for a team, more so than for a position only: senior Gallup scientist, Tom Rath has written a book called StrengthsFinder 2.0 that has taken the business world by storm (it is the only book to appear on Amazon’s top 10 bestseller list consistently for the last decade). This system helps people uncover their natural talents that are so often untapped. It can help people identify where others naturally compliment their strengths, thus enabling “super teams” that have potential to become highly productive business growth-hackers. 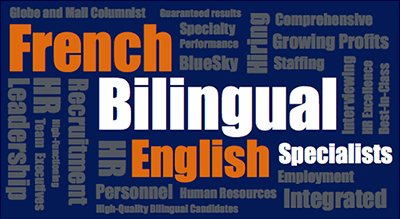 Interestingly, BlueSky Personnel Solutions has long embraced this strategy for recruiting on behalf of our clients – we consider not only the needs of managers, colleagues and direct reports, but also their personalities and aptitudes, in order to find great talent that fits “like a glove” with the team. Beyond skills, a person’s natural strengths will only continue to grow as a focus when hiring. Beyond selling the company brand, it will be all about selling impact to attract talent: gone are the days when employees had a staunch focus on climbing the corporate ladder. Over the past decade, we’ve seen growing importance for HR teams to “sell” their brand as a great place to work – especially given how competitive the marketplace has been. We’ve seen growing partnerships between HR and marketing departments in order to achieve this. Plus, employees have, in many instances, been encouraged to be passionate social ambassadors for their companies. Today however, great talent is becoming much more savvy in choosing who they want as their employer. There is a growing shift towards finding work that makes a discernable impact. In keeping with such changing times, as HR and hiring managers, we must also reconsider how we “sell” our company, and shift our pitch to the type of impact a person will have in their position – both on the company and in our general culture. Answering “the why” behind the work will be a critical factor in finding the best talent. Self-care will become a critical new buzz word: we are no longer living in a corporate culture that glorifies over-worked, over-tired, busy-ness. While “work-life balance” was a buzz word for many years past, a new term is popping up today and growing in significance – “self-care.” Employees are recognizing the need to take time for themselves and to take care of themselves. As a result, employers who build their profile as organizations advocating for self-care (who also walk the talk) will be the winners in our highly competitive marketplace. There have been many articles written about how self-care leads workers to greater productivity, and embracing this trend just makes good business sense. 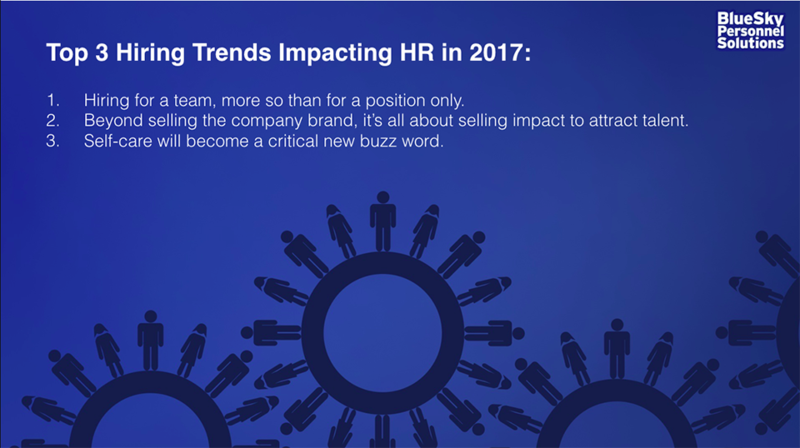 Have you encountered other important HR and hiring trends that will make an impact in 2017? We’d love to hear from you! Please share them with us here, or through our social media channels. Cheers to your business success!